Mixing creative world-building with practical know-how, and using my background as a former military officer and writer, I’ve designed a system where you get dropped right into the thick of an outbreak. Discover if you’d survive the zombie apocalypse–without any pesky side effects (like getting your face eaten off) . Simply click the hyperlinks on your favorite e-reader and find out. Host a party with INFECTED: The Game. 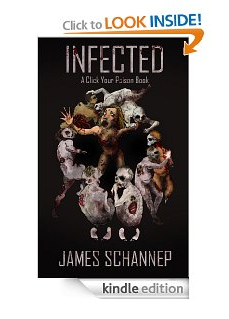 “Infected. Is. So. Good.” -A girl just like you. “Holy $#*% this is awesome!” -A guy more or less like you.